Compared to older heat pumps, 14 SEER is excellent and will produce energy savings immediately. The Amana SSZ14 Distinctions heat pump offers 14 SEER along with warmer air out of the register, a major step up from heat pumps of a decade ago. This unit also comes with an affordable price tag, making it a popular choice for many homeowners wanting to lower their energy bills without putting out too much cash up front. This HVAC prices post from Dan in Jonesboro, Arkansas shares the Amana SSZ14 Distinctions heat pump price he paid. 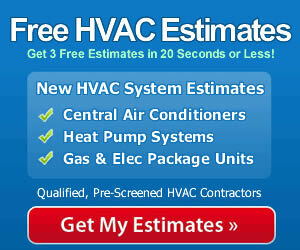 We hope this information is helpful as you consider your own HVAC system purchase. 15 SEER for cooling and 9.o HSPF for heating. Energy Star / qualifies for energy efficiency tax credit. 3 ton cooling and 24,000 Btu’s heating, though sizes to 5 ton/60,000 Btu are available. Scroll compressor for best efficiency. Compressor sound blanket, muffler, sound control top and insulated cabinet for low noise operation. Compressor crankcase heater, suction line accumulator, filter dryer all installed. Pressure switches for both high and low pressure situations. Lifetime warranty on the compressor; 10-year warranty on everything else. It sounds like Dan is a handy guy. You may wonder why he didn’t tackle the install. He didn’t say, but often those with DIY skills realize that specialized skills and even tools that most guys don’t have are required for the job. Plus, some manufacturers require a certified dealer to install the unit or the warranty will be voided. It always makes sense to have a qualified contractor handle the work. It’s the best way to get the best results from your purchase in terms of performance, energy economy, reliability and even safety. When you get all of these things from your unit and it lasts as long as it should, you’ll agree that professional installation is money well spent.